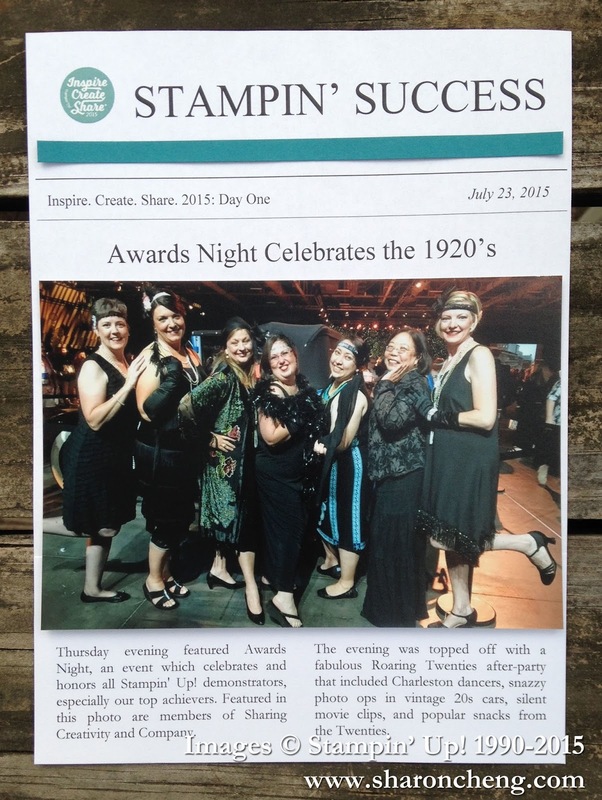 Making a scrapbook page look like the front page of a newspaper for a Splitcoaststampers challenge was the most intimidating challenge for me. After I was done, however, I loved the page and plan to use this idea for more of my Project Life pages about Inspire, Create, Share 2015, Stampin' Up! 's convention. I knew that I was going to use this picture from Awards Night. The theme was the 1920's. All of our group dressed up for the party. I decided to use Microsoft Word to make the "headlines" and to write the "article". The headlines were pretty easy. I did copy and paste the image from Inspire, Create, Share 2015 for the newspaper "logo". By using the columns and justify features, the journaling looks more like newspaper columns. The page is 6 x 8 1/4" to fit the Project Life full page. I can't wait to change the Word document to feature the highlight of each day of convention. 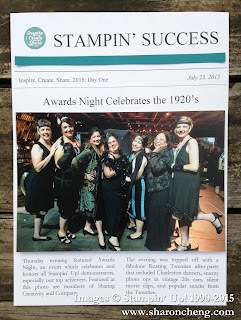 Be sure to check out the Splitcoaststampers Challenge to see what other Stampin' Up! demonstrators have done for this front page challenge.